Whether for transporting liquid or gas: At Schlemmer, you will find the right solution for your special requirements. Our standard Air and Fluid products often form the basis for your individual requirements. Schlemmer’s corrugated and smooth tubes can, for example, be produced with up to five layers, depending on the requirements. 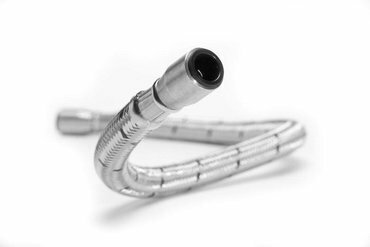 Our Schlemmer standard products include corrugated tubes and fuel hoses for wiper/washer lines. A further standard product of our medium-conduction solutions is the special Schlemmer tube for heating and cooling systems. It is offered both in the standard version and with customer-specific adaptation. The fuel-resistant tube is both electrically conductive and electrically dischargeable. The connections are standard nickel-plated brass, blank or stainless steel and can be further customised according to customer requirements. Due to its variable layer construction, it can be coated with an AISI stainless steel mesh, as required. The special tube is oxygen-tight, acid and alkali resistant and temperature resistant in the range -40°C to +240°C. In addition to our standard portfolio, we can also implement individual add-ons for you in the Air and Fluid segment. In combination with other processes, such as injection moulding or high-precision injection moulding, the ideal product for your specific requirements can be created. Please refer to our "Customer-specific solutions" section.